The internal anatomy of our lungs is surprisingly variable, and some of those variations are associated with a greater risk of chronic obstructive pulmonary disease (COPD), a new study led by researchers at McGill University and the Columbia University Irving Medical Center has found. The variations occur in large airway branches in the lower lobes of the lungs and are readily detected with standard CT scans. The findings suggest that people with certain variations might, in the future, need more personalized treatments. COPD is a progressive lung disease that causes airway inflammation, makes breathing more difficult, and is the fourth leading cause of death in the world. COPD usually occurs in people with a history of smoking, commonly after they have quit smoking, but is increasingly recognized in those who have never smoked. Benjamin Smith, an assistant professor in McGill’s Department of Medicine and the study’s first author, noticed that variations in the large airways of lungs had been reported in old autopsy studies. So he and the other researchers set out to see how common those variations are in the general population, and if they were associated with COPD. For the study, the researchers examined CT scans from more than 3,000 people in the Multi-Ethnic Study of Atherosclerosis (MESA) Lung Study. 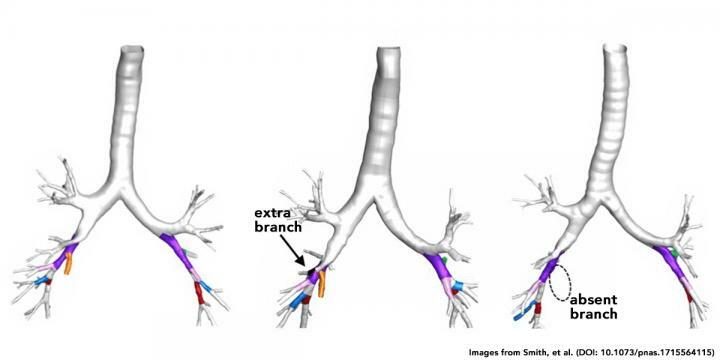 About 16 percent of people possess an extra airway branch in the lung, about 6 percent are missing a branch, and another 4 percent have a combination of variants or other patterns. The results were published online Jan. 16 in the Proceedings of the National Academy of Sciences. People with an extra airway branch were 40 percent more likely to have COPD than people with standard anatomy. And people missing a specific airway branch were almost twice as likely to have COPD, but only if they smoked. The findings were replicated in a second study of almost 3,000 patients with and without COPD. These airway tree variations are identifiable on low-dose screening lung CT scans, which are currently indicated clinically for lung cancer screening in older patients with a history of heavy smoking in the prior 15 years. 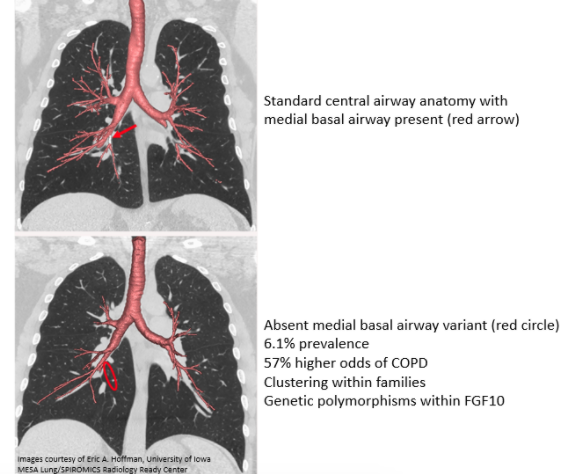 Before CT scans are used outside of this group for the identification of airway variants in clinical practice, the study authors say more research will be needed to confirm that preventive or therapeutic interventions based on the presence of airway tree variations can improve patients’ outcomes. Smith emphasized that for all the new findings, quitting smoking remains the best antidote to COPD, and smokers trying to quit should seek professional help, if necessary, to succeed.